Is Eating Disorders Work a Fit for Me? - Marci R.D. Is Eating Disorders Work a Fit for Me? If you are uncertain about whether or not eating disorders counseling is a good fit for you, you are not alone! 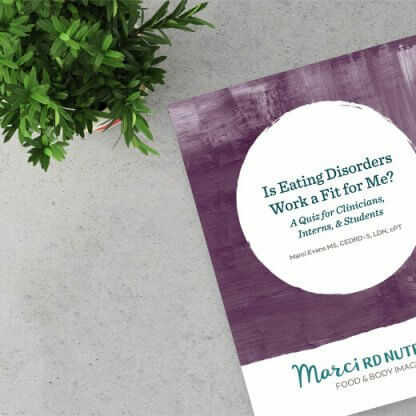 Even though eating disorders are quite common, our traditional dietetics education doesn’t prepare us for the specialized counseling these clients require. So if you are interested in the field of eating disorders but want to know if it’s a match for you, take my free quiz. It will help you understand your strengths and opportunities for growth. At the end, I’ll provide you with recommendations for next steps.